Guernsey experienced a tough time during the 2015 Channel Islands Finals night at the Geoff Reed table tennis centre, but still came away with 7 of the 18 available titles on the night. The flagship Men’s and Women’s Singles events were shared by the Islands after Dawn Morgan’s (pictured) 4-2 success over Sofia Uddnas was counteracted by Joshua Butler’s 4-2 loss to JTTA Development Officer Craig Gascoyne. 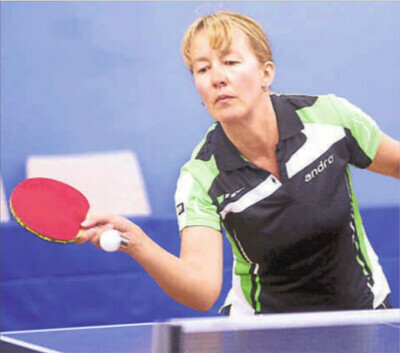 Morgan’s win gave her a remarkable 15th CI Women’s Singles crown, a title that she first picked up in 1981 during a period where Pauline Soper was the leading force in CI table tennis. It is also her first since 2011, ending a run of 3 consecutive titles for the absent Alice Loveridge. The match itself was very well contested and it is fair to say that Morgan held her nerve better than her Swedish opponent due to her success in the deuce ends, of which there were 3. Two such ends were the order of the day straight from the offset, Morgan showing her composure by closing both out 12-10. Despite picking up the opening 2 legs, the offensive threat posed by Uddnas was evident, particularly off the backhand wing where she was unleashing some awesome backhand topspin drive kills. This was particular evident in the following 2 games which she took to level proceedings. Morgan raised her level in the 5th and took it fairly comfortably to put herself in pole position to regain the title. The 6th and eventually decisive leg followed a similar pattern to the opening 2 games and mishit backhand from Uddnas that flew down the line at 8-9 piled the pressure on the Sarnian. Fortunately the pattern of the opening 2 games was followed once more and a 12-10 verdict settled the match. Butler’s encounter against Gascoyne was a match that could have gone either way and a pivotal 5th end turned out to be the decisive factor in the result. The first game was tight, but Gascoyne clinched it 11-9. A bad start to the 2nd left the Guernseyman facing a 4-2 deficit, but he then reeled off 6 consecutive points to lead 8-4, a lead he eventually converted when taking the end 11-7. The momentum was certainly with the 18 year old at this point and he stormed through the 3rd 11-4, giving Gascoyne no chance to settle into his game. The 4th was a role reversal and it was the Scot that took it by the same score of 11-3. The crucial 5th was up next and Butler was in a good position towards the latter stages, with each player within a point of each other. It was at this stage that Gascoyne enjoyed some good fortune with 2 edge balls within 3 points, including one off a long push down the middle of the table at 10-10. This was the small difference in the leg and he took it 12-10 after claiming the next point. Butler refused to give in and continued to fight, however it was Gascoyne who had too much in the tank in the 6th, taking only his 2nd CI crown after his first which was claimed back in 2008. There was further success earlier in the night and some came during the opening round of matches of the evening in the Under 18 Open Doubles. The combination of Alex Robinson and Ben Foss had too much in the locker for Jordan Wykes and Tyler Gosselin and the 4-1 win obtained by the Guernsey duo incredibly turned out to be Wykes only defeat of the weekend. The other opening round matches did not go to plan, with Jersey taking all 3 with convincing displays. Morgan lost out to Eugene Ellis 4-0 in the Over 50’s Open Singles and his relentless flat hitting off both wings proved too much in the end. At the younger end of the scale in the Under 11 Open Singles, Caden Brouard was beaten 4-0 by the impressive Leon Pierre who looks to be one for the future for the Caesareans. Another impressive Jersey player is Luc Miller, who has come on leaps and bounds since last year. The Jersey player was always in control during his 4-0 win over Luke Bichard in the Under 13 Open Singles, Bichard’s best chance coming during the 2nd where he was edged out 15-13. The 2nd round was also disappointing from a Guernsey perspective with the hosts taking 2 of the 3 available titles up for grabs. Guernsey’s sole success came for Ian Fitchet in an epic battle with stalwart Malcolm Gallichan in the Over 70’s Open Singles. Fitchet held substantial leads in the opening 2 ends but was pegged back in each. He bounced back in the 3rd, but looked in trouble after losing the 4th and facing a 3-1 deficit. Despite being in this precarious position, Fitchet had always looked in control during the encounter and it was only his errors that was keeping Gallichan in the match. He evidenced this control when powering through the following 3 legs, dropping just 16 points en route to the title. Morgan and Kay Chivers may have only won 3 CI Women’s Doubles titles in their career and this is largely due to them having previously played and earned CI crowns with mainly Tina Pipet and Anne Rihoy respectively. They have however competed at some of the largest events together which includes numerous medals at the Island Games, inclusive of a Gold in Guernsey in 2003 and more recently a silver in Aland in 2009. They were heavy favourites going into their clash with Uddnas and Kelsey Le Maistre and opened up a 2 game lead as expected. The Jersey combination was playing positive table tennis though and were attacking off both wings to good success. This enabled them to get back into the match and their consistency grew as the match went on, resulting in a 7th game to decide proceedings. A great start was garnered by the Host Island pairing and they motored through it 11-3 to earn an unlikely win. Another 7 game thriller to go the way of Jersey was during the Under 18 boys encounter between Robinson and Wykes. Robinson may have inflicted a rare defeat on Wykes in the Under 18 Doubles alongside Foss, however he was not quite able to do it again on this occasion. Despite the loss, the match was superb and showed the true fighting spirit of Robinson, the busiest Guernsey player during the weekend due to the 12 matches played. It would have been quite easy to roll over to the consistent backhand pimple punching strokes of Wykes whilst facing a 3-1 deficit, but Robinson fought hard and managed to force a decider. Once more the match looked over with Wykes taking a 5-1 lead at the change of ends, but Robinson again got himself back into it and looked favourite when leading 9-8. Wykes has true composure at all times though and he managed to hold his nerve by clinching the next 3 points and sealing it 11-9. Robinson and Morgan lost out 4-0 to Josh Band and Uddnas in the Mixed Doubles final, however that is not a particularly fair reflection on the match itself. The Jersey pair most certainly had the rub of the green so to speak and this particularly assisted them in picking up the important 2nd end 15-13 and the 4th 13-11. Miller had shown his class during his earlier win over Bichard, but he raised his level once more during his encounter with Foss in the Under 15 Open Singles. Foss took the opener 11-6 and may have felt confident of obtaining victory, however Miller is a serious player and showed his class when running through the next 4 games. The disappointed Foss will feel unlucky not to have taken the 3rd or 5th games, which were taken 12-10 and 14-12 respectively by the Jerseyman. The penultimate round of matches followed a similar pattern, with Jersey once more taking 2 titles to Guernsey’s 1. Ogier and Jez Powell made no mistakes during their straight game win over David Cronin and Kevin Allen in the final of the Veteran’s Open Doubles, the most clinical Sarnian performance of the evening. Robinson and Liam Robilliard did not quite get going during their Men’s Doubles clash with Band and Wykes and lost out in straight games. The 2nd and 3rd games were closely contested though, with each going the way of Jersey 12-10. Fitchet could not make it a double during his Over 60’s clash with Bruce Gallichan, the Jersey player cruising to an expected straight game win. The final round was once more 2-1 to Jersey and included the previously mentioned Men’s and Women’s Singles ties. The other match in this round was the Under 21 Open Singles and saw a hotly anticipated re-match between Robinson and Wykes. As with a lot of the matches during the night, Jersey were winning the deuce games and the opening 2 were edged by Wykes 12-10, 15-13. The 15-13 end saw the most bizarre circumstance with Wykes leading 14-13. Whilst serving, Wykes accidentally let go of his bat at the same time and it flew across the table into the net. Robinson failed to return the serve and the point and game was awarded to Wykes by the umpire. Wykes had too much throughout the rest of the encounter and despite Robinson taking the 4th 12-10, Wykes closed it out 4-1 with an 11-7 triumph in the 5th. Guernsey picked up the Veteran’s Women’s Singles and Under 18 Girl’s Singles titles by default due to Jersey being unable to field opposition. Morgan and Chloe Le Tissier picked up these titles respectively.